Competition gallery and results table are now up to date with December's club meeting. This is the last update for 2018, may I wish all our readers a Happy New Year, see you in 2019! Competition gallery and results table are now up to date with November's club meeting, with thanks to Chris Bradley for doing the photos this month. Competition gallery and results table are now up to date with October's club meeting which included the annual Wattisham Anker Trophy, this year on the theme of Cilvilianised Vehicles. It was won by Andrew Prentis with his Thunder Models kit build of the Scammell Pioneer Recovery in the cicilian marking of Wynns heavy haulage. Competition gallery and results table are now up to date with August's club meeting, with thanks to Chris B for doing the photos this month. Camberly Classic Car Show was held on 18th August and Bruce from CBL Models offered us a table outside his shop to show off our modelling skills to the multitude of passers by! As a result, Chris McKee. Jim Potts and myself, ably assisted by Alan Simpson and his scratch building prowess, spent the day building the Dragon 1:6th scale US Jeep. I can't honestly say its a great kit to build, there were plenty of issues to deal with, not least the short shotting of the accelerator pedal, missing fromt he sprue but superbly scratch builit by Allan from a spare bit of sprue. The less said about the overlong rear axle the better! We completed building the model but didn't paint it, we've left that for Jim to do with the airbrush upstairs in the shop :) Overall it was good fun and a lot of interst was shown by the public and quite a few flyers for ModelFest next month were taken, so it has helped riase our public profile. There were some 'professional' lookig video cameras around and we were videoed a couple of times. Thanks to Bruce for hosting us and taking the above photo. Boscome Down Aviation Collection's annual model show took place again on 12th August and we were there, braving the rain with a bewildering array of models. Chris McKee won a silver for his RAF Rescue Launch and I won a Bronze for the USS Sulaco from Aliens. Apologies for being so slow updating the site this month, house moving got in the way a bit! 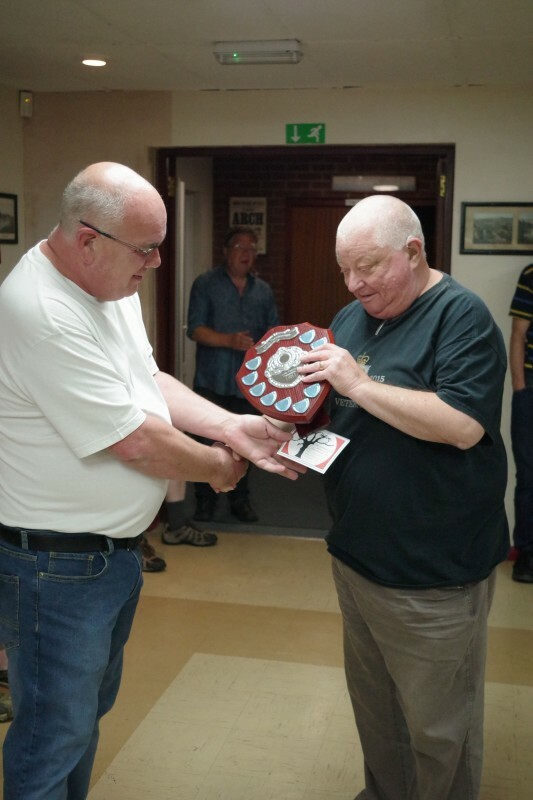 Competition gallery and results table are now up to date with June's club meeting. 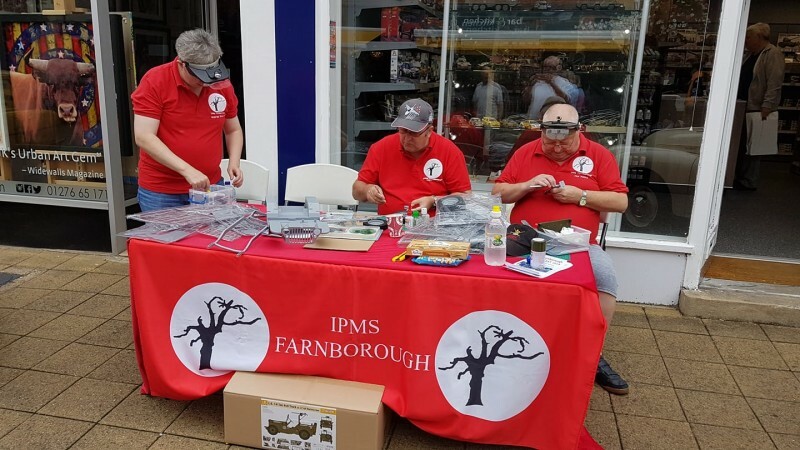 The beginning of June saw the usual crew invade the IPMS Salisbury show. Not a single NBC suit in sight! I'm afraid I forgot to take a photo of the club table, but here is the group reporbate photo as consolation! 14th April was the Poole Vikings show ona lovely sunny day. In the show competition, Chris McKee won a gold for his Harrier and I won a silver for the Eagle Cargo Transporter. A good day. 28th April was Theamscon in Abingdon. This was a TV/comic/media convention which had a small section for modellers which included Models for Heroes, IPMS Milton Cheney and their SciFi models and cosplay and I filled a table with my SciFi models collection. Lots of interest fromt he public - the Thunderbirds models are always a hit for people of a certain age :) The kids live Iron Man as well... Paul came along to assist with carrying boxes, so cheers, there were a lot! Good lord, its a photo with me in it!! Overall, a great time was had by all! The club AGM was also held with all the officers agreeing to continue for another year, It was announced that the September Member's Trophy slot would be changed to become a new Trophy: The Canadian Trophy, so the Member's trophy now becomes an annual event rather than bi-annual. This month was the Antipdean Trophy and the winner was Mark Worboys with his 1:48 Mirage IIIO from 75 Sqn RAAF. Thanks to Chris Bradley for doing the photography this month while I recover from the lurgy! The Competition gallery and results table are now up to date with February's club meeting. Happy new Year to all our readers! The news for 2017 has been archived under the "2017" menu entry. Competition gallery and results table are now up to date with January's club meeting.